Six months of decline - but what do the markets actually want from Japan's one-time giant? In the wake of Nintendo's conference last week in Tokyo, it was widely reported that the company's stock fell by around 5% in trading after the announcement of the firm's new games for the 3DS. It's a stinging reaction for a company which only a couple of years ago was valued (ridiculously) as Japan's second most valuable, after the world's top car manufacturer, Toyota - but to understand what that kind of swing means, it's important to look more closely at the stock and its recent history. First of all, let's look at the context to the movement - specifically, the performance of Nintendo's shares over the past year. It's tempting to look further back and consider the dizzy heights of 2007's ridiculously over-enthusiastic valuation, but while that would give us an extremely steep graph to cluck about, it's not actually all that helpful or informative. 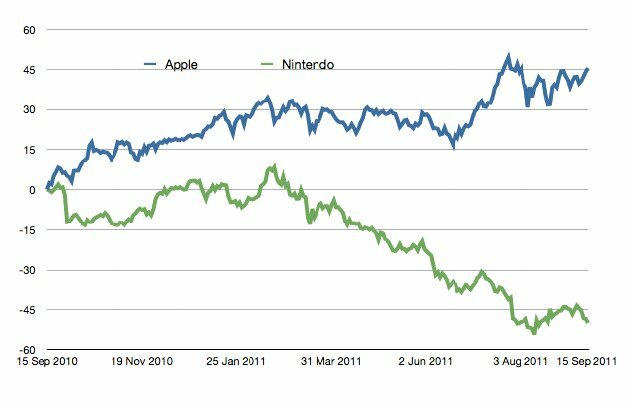 Suffice it to say that if you were an investor so swept away in the excitement of the Wii and DS' market dominance three years ago that you actually bought Nintendo shares at their peak, they've now lost 80% of their value and you've probably been fired (and rightly so). The reason that isn't really a helpful graph is because several very important things happened in the years since Nintendo's valuation peaked, and neither of them had anything to do with Nintendo itself. The first was the credit crunch - often called the "Lehman Shock" in Japan - which was responsible for the vast bulk of that loss of value. After the Lehman Shock, Nintendo's stock had dropped 60% of its peak value - so events since then only account for the last 20% of the decline. Dismiss as nonsense any claim that the enormous decline in share value since 2007/08 is a sign that the markets think Nintendo is on a road to utter disaster. Moreover, "events since then" also encompass the Great Touhoku Earthquake six months ago, which understandably impacted on share prices in Japan, and the historically strong Yen, which has been extremely damaging to export-led industries (including Nintendo), and has also depressed Japanese stock prices. None of that has anything to do with Nintendo's business model or product line-up, so our first order of business is to dismiss as nonsense any claim that the enormous decline in share value since 2007/08 is a sign that the markets think Nintendo is on a road to utter disaster. The markets, let's not forget, still value Nintendo at over 1.5 trillion Yen - a far cry from their extraordinary valuation in 2007, but still the world's most valuable games company. That valuation racks up to some £12.4 billion plus spare change at the present exchange rate, which makes Nintendo almost 50% more valuable than Activision Blizzard. This is Nintendo's one-year chart. The overall trend is easy to see - while the first few months are bumpy, there's as much optimism as there is pessimism in the pricing, but then around mid-February, the prices start a steady decline which brings us pretty much right up to the present point in time. Two things happened in February/March which are worth considering when looking at this graph. The first, of course, is the earthquake on March 11 - and you can see the influence of that easily, in the form of the very steep price drop in early March, which then seems to be mostly corrected out over the course of the next few weeks. The other thing, of course, is the launch of the 3DS - and at first glance, it certainly looks like Nintendo's fortunes on the stock market have been on a downward trend from exactly the point when the 3DS hit store shelves. It's also worth pointing out that E3, which took place this year at the end of the first week of June, caused a further price slide - that's in the wake of the Wii U announcement. In fact, the slide that we saw after Nintendo's pre-Tokyo Game Show conference isn't actually particularly pronounced compared to various other precipitous falls in the company's stock value this year. The green line in that graph is the Nikkei 225, an index which tracks the performance of most of Japan's top publicly quoted companies. By an odd quirk, Nintendo isn't actually on this index despite its size - this is because Japan actually has two stock exchanges, one in Tokyo and one in Osaka, with the Nikkei 225 being based on firms listed on the Tokyo exchange. Nintendo, a company which has been headquartered for over a century about half an hour outside Osaka in the suburbs of Kyoto, is listed on the Osaka exchange. Despite this, however, the Nikkei 225 is a solid way to see the influence of macro-economic factors on Japanese share prices - so divergence between a company's performance and the NI225's performance is a fair measure of success or failure. On that front, this graph is extremely telling. Nintendo's shares tracked the Nikkei fairly closely up until mid-February (as you'd expect from a comparison of a single stock to a large index, the ups and downs are a bit more pronounced, but there's nothing dramatic there). Then a steady decline begins which drags Nintendo's valuation further and further south of the movements in the NI225 - with the earthquake again visible on the graph, but even more clearly a temporary rather than lasting effect. What this means, in essence, is that even once you account for macro-economic factors, the markets aren't happy with Nintendo. There's a steady price decline visible, and worse, the points when that decline are reversed are little to do with Nintendo's own strategies. A peak in early July is matched on the Nikkei 225 index, because it's related to currency fluctuations rather than anything Nintendo itself did. In August, Nintendo dropped to a five-year low after announcing very weak financials (by its own high standards, I should point out - the company is in absolutely no financial trouble at this point), but then started to rise again sharply. Some of this is down to the market correcting for an over-reaction, but some commentators also implied that investors were reassured by the aggressive nature of Nintendo's 3DS U-turn. The truth of that rise is rather more prosaic. The Tokyo Stock Exchange is presently in talks to take over the Osaka Stock Exchange, which would mean that Nintendo could well be listed on the NI225 index - a move which would force institutional investors to buy Nintendo stock as part of their NI225 portfolio. The potential for that change drove Nintendo's stock higher (along with several other companies on the Osaka exchange), not investor excitement around the 3DS' new price point. 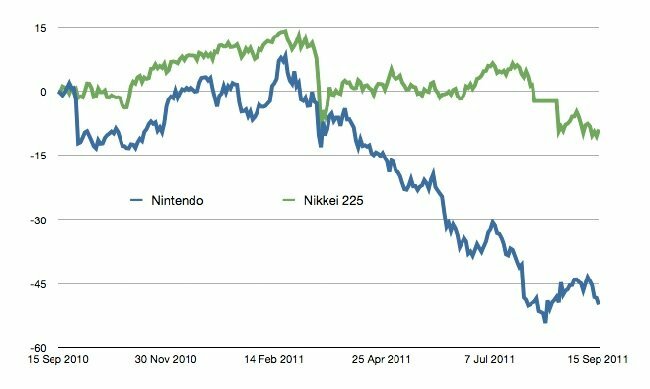 In the more immediate term, it's also worth noting that Nintendo's 5% fall in the wake of their TGS conference seriously underperformed the NI225 on that day, so yes, it's fair to say that it was a direct market reaction to the conference. However, when looking at all of those things, it's important to understand what markets actually react to - because it's not the same stuff that consumers or industry insiders react to. There are complexities to day to day behaviour, but in the long run, stock markets reward only one thing - growth potential. It's tempting to assume that a company which continues to be profitable in a steady manner will maintain a steady share price, but that's not how the markets work. If you make $100 million this year, that's great, but unless investors can see a path towards making $110 or $120 million next year, they'll desert you in droves. Investors in the stock market are looking for strong growth - if they wanted low-risk and low-yield, they'd be investing elsewhere (government bonds, for example). 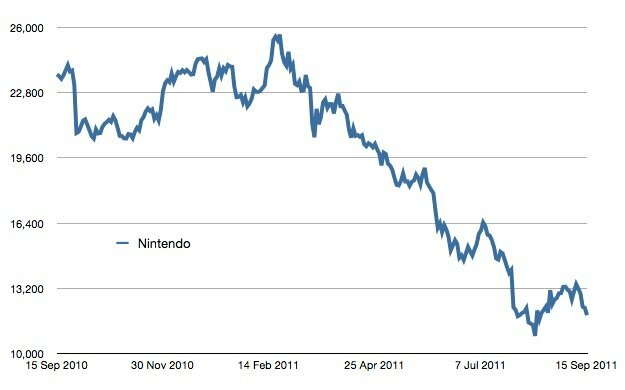 Nintendo's immense share price a few years ago was down to the fact that it was growing its market at a rapid pace - its decline now isn't necessarily reflective of a huge decline in market share, but rather of the fact that investors have lost confidence in the company's ability to keep growing. The markets aren't punishing Nintendo because they think it won't be profitable in future - they're punishing it because they think it can't return to the stellar growth of the Wii era. Specifics, oddly, don't matter that much. Industry insiders and commentators can look at deals like the one which is bringing Monster Hunter to the 3DS and understand that this is an important release that will do great things for the console's uptake in certain markets, but on the whole, the markets don't care about that. Sentiment around Nintendo is negative at the moment, because investors see the company's last console release as a failure and worry about its market being eaten up by mobile phones (both reasonable positions to take). That sentiment overpowers any detail within the picture - until Nintendo can come up with something that incredibly clearly demonstrates its ability to triumph over devices like the iPod Touch, the markets are going to keep avoiding it. Does that mean, as some people have suggested, that the markets want Nintendo to abandon hardware manufacture and focus instead on developing games for mobile devices? Absolutely not - and those who argue in favour of that are largely just confirming their own biases with market data, rather than considering the wider picture. Nintendo makes a huge amount of money from hardware sales; even if the new price point for 3DS means that it's selling at a small loss right now, economies of scale will soon fix that. To begin publishing on mobile devices would effectively mean debasing its own hardware platforms - it would still have to support its own hardware for some time (or risk losing massive amounts of goodwill from its consumers) but would be doing so expensively, in the face of diminishing sales. Meanwhile decommissioning the hardware business and transitioning the company to mobile would also cost vast amounts of cash - and at the end of this painful, expensive process, there's no guarantee that third party mobile publishing could ever match Nintendo's former revenues from hardware and software. What the markets hate most of all is uncertainty (note that after Steve Jobs' resignation, Apple's stock price actually rose, because it ended the speculation and uncertainty over the company's future administration), and that path is filled with absolutely nothing but uncertainty. That isn't to say that from a business perspective, it isn't the right thing to do - but while a smarter, leaner Nintendo focusing on titles for other publishers' platforms makes sense to those of us following the industry closely, it's a massive stretch to suggest that the markets are "calling" for Nintendo to do that. On the contrary - it would make such a transition at risk of completely destroying the value of its own shares, at least in the short to medium term. Are the markets happy with Nintendo right now? No. Is the company's stock price likely to improve in the short term? No, not really. It's likely to continue a gentle decline before finding a fairly sensible base price that reflects the company's true prospects. Is this, however, a sign that Nintendo is "doomed"? Absolutely not. The firm faces huge challenges, but its cash position is fantastic and it's still got enormous sales and market share. The markets aren't punishing Nintendo because they think it won't be profitable in future - they're punishing it because they think it can't return to the stellar growth of the Wii era. On that front, they're almost certainly correct. To close, one more graph of stock performance over the past 12 months. A disclaimer; this is an entirely unfair comparison of two companies with very different business strategies and product line-ups - but by accident or design, they're the two companies who are the chief cheerleaders for the traditional packaged goods and the app store distribution models respectively. Whether they like it or not, these two giants are going to spend the coming years at each other's throats - and it's fairly clear which of them is winning in the first round. Great analysis, as a trader I also noticed how the once impregnable company has been hit, hard. They're a smart company though, and their position in the industry is still unquestionable. Perhaps it was pride, perhaps it was apathy, but Nintendo's history of prizing their own first party content as king isn't working wonders with so much good content coming out of the hoards of app developers. We'll have to wait and see, but if they make a single misstep, we can be sure the market will crucify their stock even further. hopefully not A La RIM. Great article, sensible analysis, like analysis should be. If only more games business journalism was like this. While generally a good and interesting read, I think you're making too much of Nintendo stocks falling after their press conference. Wasn't it established that the stocks had already fallen prior to the conference, making the statement that the fall was caused by announcements made there somewhat misleading? It's my understanding that stocks actually rose after the 3DS conference. Reuters had accidentally reported it as a drop. While Nintendo transitioning to a mobile only company does present massive risk, I am absolutely certain that their hesitancy to do so is explicitly tied to their recent stock price problems. A reduction in growth potential is certainly part of it but the share price had found a plateau last year. The circumstantial drops from the earthquake/tsunami and Nikkei are minimal and not as represented in other stocks. The drops started with the Japanese launch of the 3DS. Sales were moderate but the devastating issue with regards to stocks was the PR about not using 3D for children 6 and under (the investment market believes that is a majority of Nintendo's portable age market). The US and European launches came about in similar fashion. While it is debatable those reports had an impact on actual unit sales, it did have a major impact on shares. The next valid drop came about from the fiscal year profit projections. This is the one investors got right. A large reduction in profit projection should be accompanied by a reduction in share price. Then E3 hit with many investors expecting Nintendo to either go cloud or mobile. That didn't happen so investors bailed. The Wii U could have cooked you breakfast and it wouldn't have mattered. Investors in the video game industry are dead set on mobile. Look at the mobile market investing...that's a bubble just waiting to burst as capital is over hedged. A portion of investors were even hoping for an Apply buys Nintendo announcement. Just hit up an investment adviser. 9 out of 10 will try to convince you that mobile is the future for Nintendo. Also to note that investors chase the capital. If investors money heads one way, they tend to follow each other. They trend themselves as much if not more than trending the details of the products/services of the companies they invest in. I'd go so far to say that a grand majority have absolutely no idea why they invest in a specific company other than because it's what other investors are doing. And the reverse is true. They drop stock because a trend of stock being dropped more so than because of the actual minutia of details. "but while a smarter, leaner Nintendo focusing on titles for other publishers' platforms makes sense to those of us following the industry closely,"
That makes no sense to me. Why would they put their system selling IPs onto other platforms and abandon their highly profitable hardware business, just after their two most successful pieces of hardware have been on the market? The 3DS is recovering from its poor start--the price cut has had a meaningful impact globally, and the big games are on the way at just the right time. The Wii U is still a largely unknown quantity, too, and looks to have good third party support from the off. Nintendo are in a transitional period--they're moving from their most successful machines and onto their next projects, so things are bound to be choppy. Quite why that indicates they're better off as a third party publisher baffles me, but I'll happily listen to some explanations. Great article, puts some perspective on the doom 'n' gloom attitude towards Nintendo recently. A large portion of Nintendo's (short-term) future will be decided by the sales of 2 titles: Mario World 3D & Mario Kart 7. If both of these sell in the vicinity that is expected from Nintys big franchises - its business as usual. If one or more of these "fail" at retail (fail being hard to define? much less than previous iterations?) then Ninty will have a serious problem on its hands. Its also worth remembering that it wasn't until the DS Lite launched that DS sales really took off: and its more than reasonable to expect the next iteration of the 3DS to launch mid/late 2012. Apart from the obvious upgrades, they could release a non-3D version (ideal for kids) for a budget price, incorporate the extra controls, improve the 3D display - and launch both models alongside the next Pokemon game & Monster Hunter 4 (in time for Xmas). Still plenty of hands to play, before they walk away from the table. Excellent article which, I think, pretty much sums up the markets view of Nintendo. Perhaps the only thing I'd add is a little look at Nintendo's fundamentals in terms of p/e ratio. Most investors will look at that as a guide (some religiously so). If you look at Nintendo's trailing p/e ratio (i.e. based on last year's profits to March 2011) then it is around 40 based on the current share price. That is indicative of a company that is expected to earn much higher profits in the future so, rightly or wrongly, those profits last year are clearly seen as an anomaly. If you go back to the profits they made two years ago (ending March 2010), then the p/e ratio is around 8. That is quite low and so clearly investors think it is unlikely that the profits are going to grow to those levels at any time soon. If you look at what Nintendo are forecasting for the year ending March 2012 then the p/e ratio for the current year, based on today's share price, is around 13. That is indicative of a company that is expected to grow profits going forward and is what many investors would consider "fair value" for a company that is on a path of steady growth. So, although the share price has collapsed over the past year that's because a) profits have fallen quite dramatically and b) the massive over-excitement about the Wii success is over. But the point I'm trying to make is that Nintendo isn't seen by the market as dead man walking or even a basket case. Based on their actual, and forecasted, profit they are still being valued as a strong growing company. As the article suggests, the reason for the share price fall is as much to do with the over-exuberance of the past than the current view. Getting back to Nintendo themselves and speculating about their future, I think the 3DS is never going to repeat the success of the DS because of the smartphone competition and the Wii-U is poorly thought out in terms of technical, commercial and "artistic" consideration. I thought it was a master-stroke until it emerged that it is designed for only one Wii U controller and all the other players using Wii-motes. That is daft beyond belief and, while I understand this limitation from a commercial (and technical?) standpoint it kills the idea from a multi-player perspective. They've got a year to sort it out and, from Nintendo's point of view, I just hope that they were forced to announce an idea because of E3 that they hadn't thought through yet. BTW, if anybody is interested in investing in the video game industry I have set up a website http://www.bougafer.com which has lots of resources for anybody with that interest. And for those long in the tooth, yes it did exist in the late 90s and has returned after a small (10 year) rest. @ Jimmy & Al ; I did see some quibbling over numbers in the wake of the conference, but the stock was down overall for the day and that decline has continued in subsequent days. I don't think there's any real debate about what the final reaction of the markets was (i.e. negative), regardless of what the instant reaction (which can be affected by a whole range of factors, including macro movements of the markets overall) may have been. With regard to the markets' expectation of a mobile transition for Nintendo - I'd caution that there are many different types of investor out there, and the "blue-sky-thinking" types who see Nintendo going to mobile in the short to medium term, aside from being flat-out wrong, tend to be personal or small investors and are not really representative of the big corporate investment funds which actually have a serious influence on stock prices. Those large-scale investors are exactly the ones which would bail out if Nintendo were to launch into a major and risky restructuring. Great post, Rob. Particularly pleased to see the effort that went into stripping out the big effects (earthquake's, Lehman, index inclusion) and the primer on what investors are really looking for. Good stuff. I sit much more in Michael Shamgar's line of logic. People (analysts being no exception) are quick to dismiss Nintendo's long-game strategies in favour of reactionary tactics. While they may not return to the high stock market days of the early Wii era, they still are able to survive and made decent profits with each hardware launch. Those who think that Nintendo is going to go the way of SEGA and starting to make hardware for other platforms don't really understand the history of Nintendo. Darren, just wanted to note that the Wii U is capable of using more than one Wii U at a time. Nintendo were initially only showing asynchronous multiplayer to showcase how unique the concept was and because the Wii U tablets would likely be cost prohibitive. They have long since noted the Wii U tablets will likely be sold separately for synchronous multiplayer. One should also note that the new 3DS slide stick peripheral practically makes the 3DS a potential Wii U controller.